Just as I finally catch up with my Cars collection, a new year begins! This year is going to be packed with fantastic new releases though, so I'm really pumped. 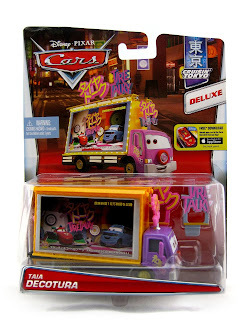 From Disney·Pixar's Cars 2, here we have the newly [re]released Mattel 1:55 scale Deluxe size diecast of Taia Decotura! He is part of the 2016 "Cruisin Tokyo" sub-series (#7/9). As shown in the screen shot above, Taia is briefly seen driving in the streets during the, what I call, the arrival to Tokyo montage. He is a flashy, colorful advertising truck (with two giant TV screens on either side) who broadcasts the Tire Talky talk show. 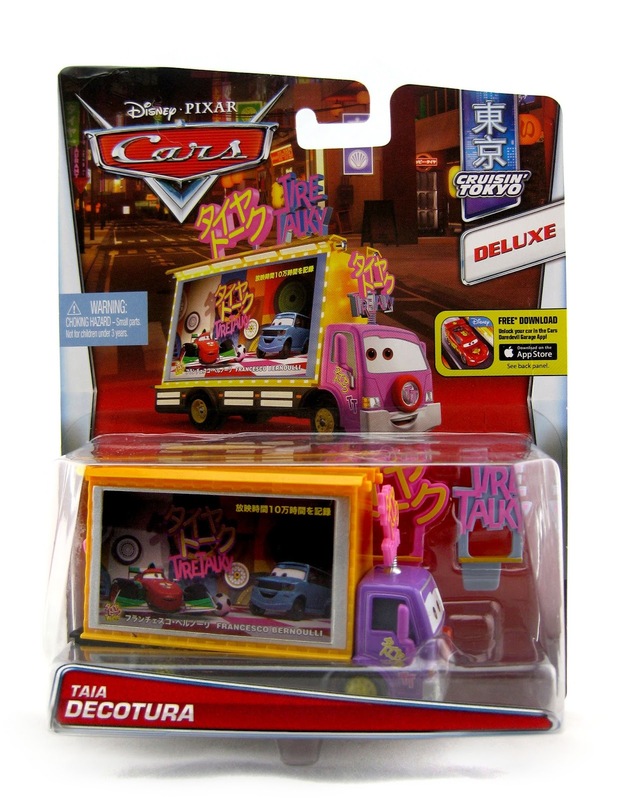 Taia was originally released in 2012 (as part of of the initial Cars 2 Deluxe assortment), but was only available internationally. On eBay his prices were always quite high, so I always hoped he would be someday released in the US...I got my wish after all these years! This is an extremely unique diecast character. There isn't another one like him! I was thrilled to have found him at my local Toy R Us just last night, so keep your eyes out for him. If you'd rather just pick him up online, visit Amazon using the direct link below. As usual, good luck on the hunt!